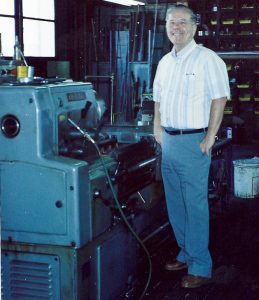 At the age of 60 and career of working for a handful of companies, Dad struck out on a business of his own, Valley Machine Shop, serving the oilfield industry. In 1982, he was pretty busy. The price of oil then had recently tripled to $30+/barrel. I had a rotating shift at a factory making plastic meat trays. The factory paid well, but the hours were brutal. Recently married, these swing and graveyard shifts played havoc with my relationship. Dad asked if I could help him out a few days a week. On days I worked swing, I’d help him a few hours in the morning. After graveyard shift, I stop by and work 4 or so hours until I got sleepy. Dad would set up the machines and I would run the parts. It wasn’t much different than my factory job in that respect. At age 28, I didn’t realize what a joy it was to work side-by-side with your Dad in his profession. I was cocky and thought I knew way more than I did. We got along well for the most part. He enjoyed teaching me his trade of forty years. Although at times it was difficult to learn from him. Machining was second nature to Dad. It was sometimes hard for him to break things down into small enough steps for me to understand. As the shop got busier, Dad started lobbying me to come work with him full-time. The money was looking good, but I was just getting some seniority at the factory and promotions might be coming my way. A few more months went by and I made the jump. Dad had convinced me it was better to control my own destiny than to rely on a big company. My factory job wasn’t the career I had in mind, so I had to agree. As part of the deal, we bought a couple of new machines. We found a new, larger lathe for Dad. I moved to his smaller lathe. We purchased another milling machine. And when he got a new toolbox, he gave me his old one. Working on his old lathe was a joy. This was the machine I learned on and it was comfortably-sized. 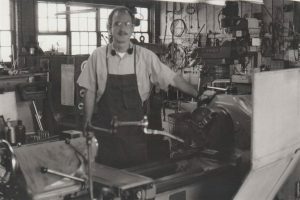 Working between his toolbox and lathe was special. He had had that thing for years. It had, tacked inside the lid, a family photo and service pins from the companies he had worked. Things went well for the first couple of months. Three months later the price of oil dropped well below $10/barrel. The industry took a nose dive. While Bakersfield had many oilfields, at this price it was no longer worth pumping it out of the ground. It was tough times. Our shop specialized in oilfield work. We didn’t have the machinery or skills (at least I didn’t) to find work out of the industry. It was easy for me to blame Dad. As I said, I wasn’t the sharpest drill in the index. Even though the factory job was a dead-end, it brought in a regular paycheck. Of course, having an extra worker and new machines to pay for didn’t exactly make my Dad a happy camper either. We eventually set our differences aside. He was sharper in business than I thought. Dad had connections with many of the oilfield companies still able to operate in tough times. He had a mind that could distill a design of the part the wireline worker thought he wanted. His brain could work in three dimensions and he could picture a tool before he ever chucked up a piece of cold stock. Dad worked until he was 72. The thirteen years I spent with him were some of the best in my life. We sold the business to one of our largest customers for a decent profit. By then he had made me an equal partner and the advice he gave at the beginning proved to be the best. Through all the time I worked out of Dad’s toolbox, I probably only altered about half the drawers. There were some tools, bits, and cutters I never touched. Of course, I couldn’t throw them away. Dad always said, “They’re metal, they won’t rot.” And, we might need them someday. The toolboxes, both his and mine, weren’t included in the sale of the business. 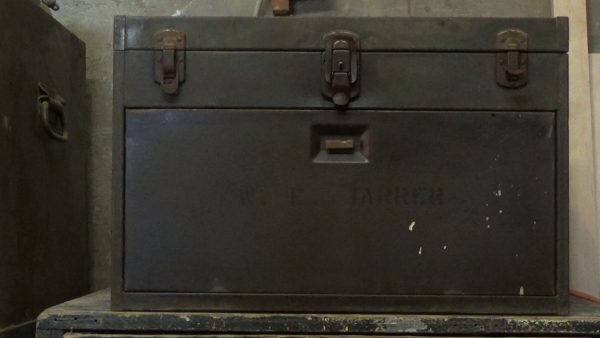 A toolbox is like your personal attache. It stays with you no matter what. Recently, I’ve developed an interest in woodworking. Dad’s been gone for 6 years now. It seemed like time to move on. I cleaned out the toolbox of many of the bits and blades not useful in the art of woodworking. Perhaps the machine shop at the local community college could use them. I tuned it up the box for some woodworking bits and tools. This way I’ll get much more use out of it. The anniversary of his birthday is Christmas Eve and I think about Dad quite a bit this time of year. Before I went through the transition-to-woodworking process, I thought it best to make a short video of the box and what it meant to me then and now. Words can hardly express it. Maybe pictures can.